I recently got a Droid Turbo 2 (Verizon edition,) which features a 3,760mAh battery, and with light use it lasts 2 full days on a single charge. This endurance, combined with the rapid charger, is a compelling feature. Once in a while my device consumes battery at twice the normal rate, which has lead me to dig in and learn a bit about battery usage. 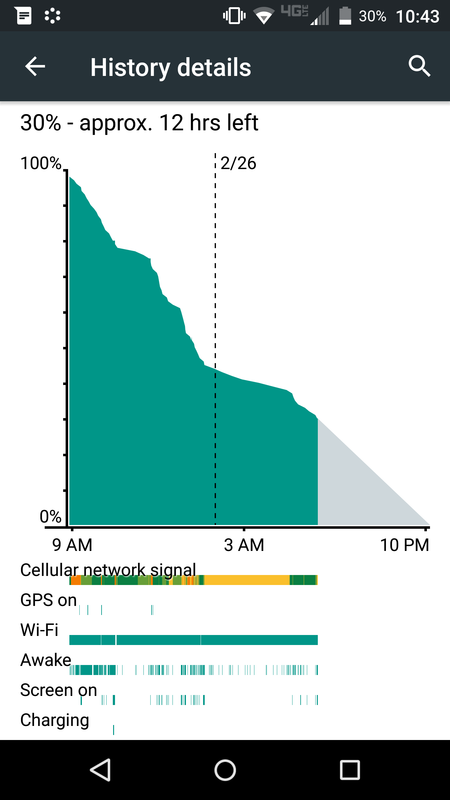 This post is about battery usage on Android 5, but keep in mind this will probably change dramatically for Android 6. Battery UI – You can access the battery UI by tapping the battery icon from the settings drawer. The UI projects your remaining battery, shows you what apps are using battery, and shows you what features are using battery. Change in-app settings – Usually I first try to disable the app’s background behavior in the app’s own settings panel. Uninstall – If the app doesn’t have background data settings, or I try to disable them and it still consumes battery, then I usually consider uninstalling the app. Change background data usage settings – If I decide I really must have the app, its possible to change the “Restrict app background data” from the “Data Usage” UI by tapping on the app name and sliding the toggle at the bottom. System Apps – Occasionally system apps are a problem but its usually the result of some third-party application. If this is the case, I usually first try uninstalling my most recently installed app to see if the problem goes away. If not, you’ll need to dig deeper. Tap the app in the battery UI and see how its consuming battery between CPU total, CPU foreground, Keep awake, GPS, etc. Some apps have options under “Adjust Power Use.” For others you can try force stopping, disabling, clearing cache and clearing data. If none of those reduce battery usage, you’re out of luck. 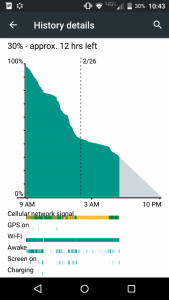 Recently I found “Google Play Services” was my top battery consumer and found this reddit thread “Battery Related Issues Look Here” I tried rebooting into safemode as it suggested, and my battery usage nearly flatlined, suggesting that a third-party app was interacting with Google Play Services and consuming battery. I didn’t know what to do right away, but I later installed another third-party app by chance which complained about an issue with Google Play services (it asked me to install the service!) This installation was enough to fix the issue, which I now assume was identity related and involved the service frequently polling for some information it needed. I’ve read you can also do things like “Clear Data” or “Clear Cache” for an app to stop this behavior.